Day 15 of 30 Days of Hell finds us all in China. No. Wait. The topic is China. I really didn't have time to go to China today. Nor the desire. 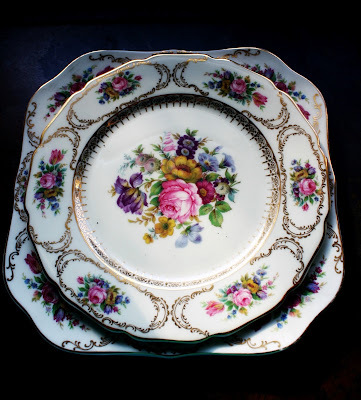 So I join the ranks of dozens of other participants who will post photos of fine china. Or maybe not so fine china. There could be some photos of paper plates. I'm not a fan of matchy matchy in furniture or place settings. Although I have several nice sets of china, my eyes search out interesting pieces of china when I'm out junking. I don't want complete sets, just assorted pieces to mix in with my existing collection. I think a beautifully appointed table is an artistic mixture of interesting china. I found a few pieces of this German fine china at a sale in a friend's shop. I paid $8 for a stack of 11 square luncheon plates and 3 round luncheon plates. 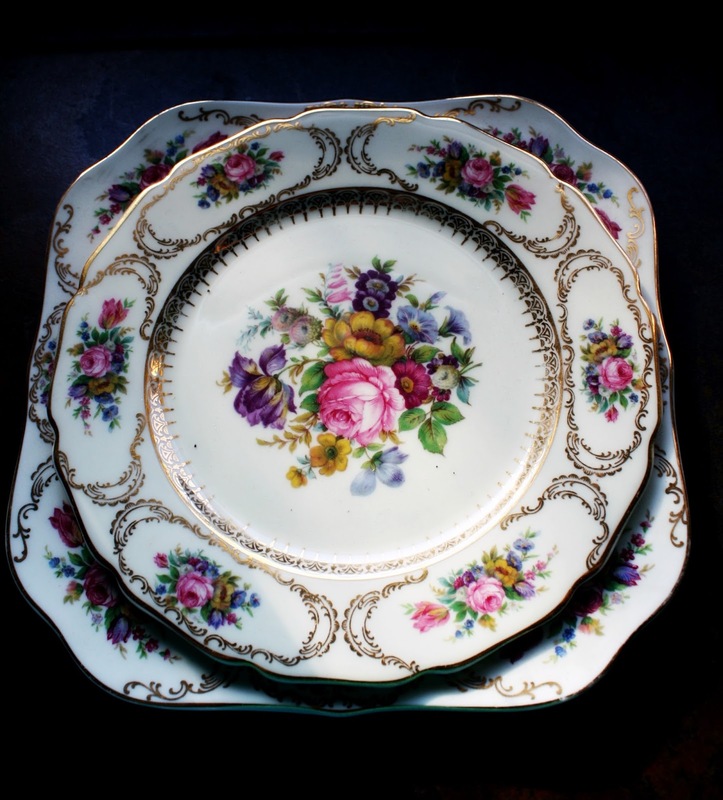 The back of the plates are marked as Queen's Bouquet and was made by Continental Ivory in Germany in the 1920's. I knew I had to have it the minute I saw it. Not because of the label, but because I liked it. I use it all the time mixed in with other varieties and patterns of china. It's purty. Today, I looked up the value of my $8 purchase. Replacement cost for these few pieces? 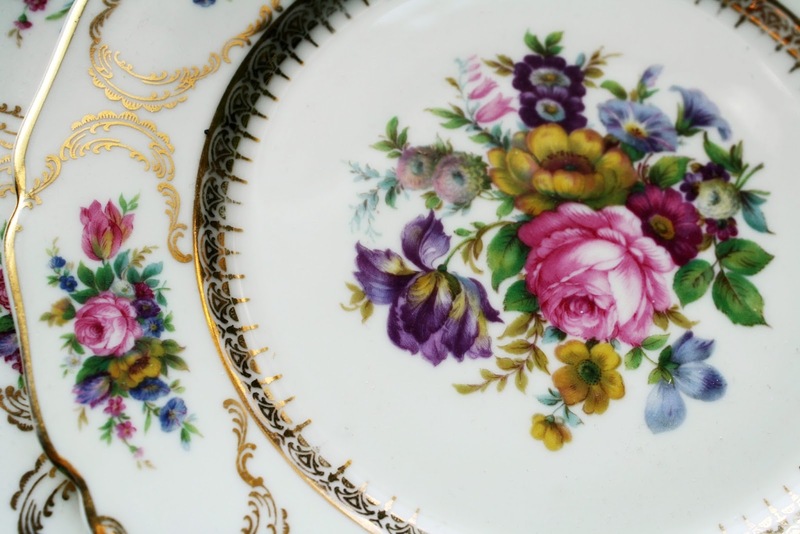 These plates just got purtier. Go visit the other participants' photos of China. They may have something more interesting. Or maybe not. But what else have you got to do? You just read this boring post, so you obviously have some extra time on your hands. Go HERE and take a peek. I would throw a plate at MikeWJ and Ziva who thought up this whole crazy photo non-contest, but that would take $96 from my collection. No way! So here we are. Retirement comes early. Romance never ends. Side by side. Always and forever. Can we find life, fame and fortune by just being in love? Absolutely! Please join us and support us on our road to creating a new path.